Read more on the Stillwater Amateur Radio Association website. Users connecting to W0EQO will now hear the receiver audio immediately instead having to find and toggle the power button on the graphical user interface. While there are keystroke commands for the basic functions used in operation of the RCForb software, there is no such command for the radio’s power switch. That meant that JAWS users had to use a tedious process of trying to find the button labeled PWR with the JAWS cursor. Now when you connect the radio is already running. Check out the two HF remote base internet stations available to club members. Find out more at https://handiham.org/remotebase. See the user guide on this website, too. 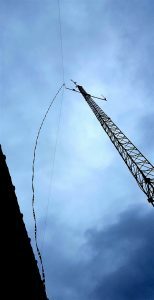 The photo shows the dipole antenna fed with 450 ohm ladder line. It is high on the tower at the apex of the inverted vee. The legs are 150 feet long, for a total dipole length of 300 feet. What are you waiting for? Check into our Handiham nets… Everyone is Welcome! You will also find us on the IRLP linked repeater system. Look for IRLP 9008. The Handiham Net will be on the air daily. If there is no net control station on any scheduled net day, we will have a round-table on the air get-together. Our daily Echolink net continues to operate for anyone and everyone who wishes to participate at 11:00 hours CST (Noon Eastern and 09:00 Pacific), as well as Wednesday evenings at 19:00 hours CST (7 PM). If you calculate GMT, the time difference is that GMT is six hours ahead of Minnesota time during the winter. Note that we do not have a Thursday evening session at this time, that session has been moved to Sunday evenings at 8:00 PM Central Time. Doug, N6NFF, poses a trivia question in the first half of the Wednesday evening session, so check in early if you want to take a guess. The answer to the trivia question is generally given shortly after the half-hour mark. A big THANK YOU to all of our net control stations and to our Handiham Club Net Manager, Michael, VE7KI.